Hi everyone! 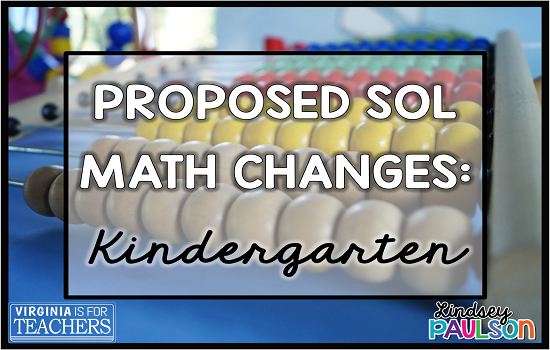 It's Lindsey today with the proposed changes to the Kindergarten Math SOLs. All review information, documents, and timeline information is on the VDOE site. You can find the proposed SOLs here and the Proposed Curriculum Framework here. Kindergarten goes from 16 to 13 standards with a lot completely moved to 1st and 2nd (no telling time, count by 5's 10's, tally marks, ordinal positions). A bigger emphasis on decomposing (breaking apart) numbers and subitizing (quickly ID groups). This is much more aligned with the focus of the Common Core and will greatly help build a firm number sense. old K.3 - Moved ordinal numbers to 1st. Yeah! K.3 NEW, NEW, NEW: Part, part, whole relationships with fluency to 5 (1 and 4, 2 and 3, 5 and 0, etc.) and introduce to 10 (9 and 1, 8 and 2, 7 and 3, etc.) The addition and subtraction symbols are not introduced. These quick relations are so important to building on number sense in the higher grades! K.4 - Count to 100, updated to start at any number 0-100. ID number before and after any number to include 0-100. Count backward 10-0. Moved counting by 5's and 10's to 100 to 1st. 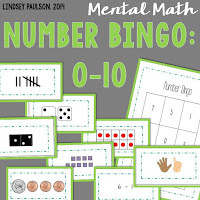 Counting by 5's and 10's is much easier than one more and one less a number to 100 so I think this standard has become much more challenging! K. 5 Fractions have been simplified to solving practical problems of equal shares with 2 and 4 people. Fractions of a set model moved to 1st. K.6 - Updated addition and subtraction with sums to 10 to include single step story problems and pictures. Addition and subtraction symbols are not introduced until 1st. 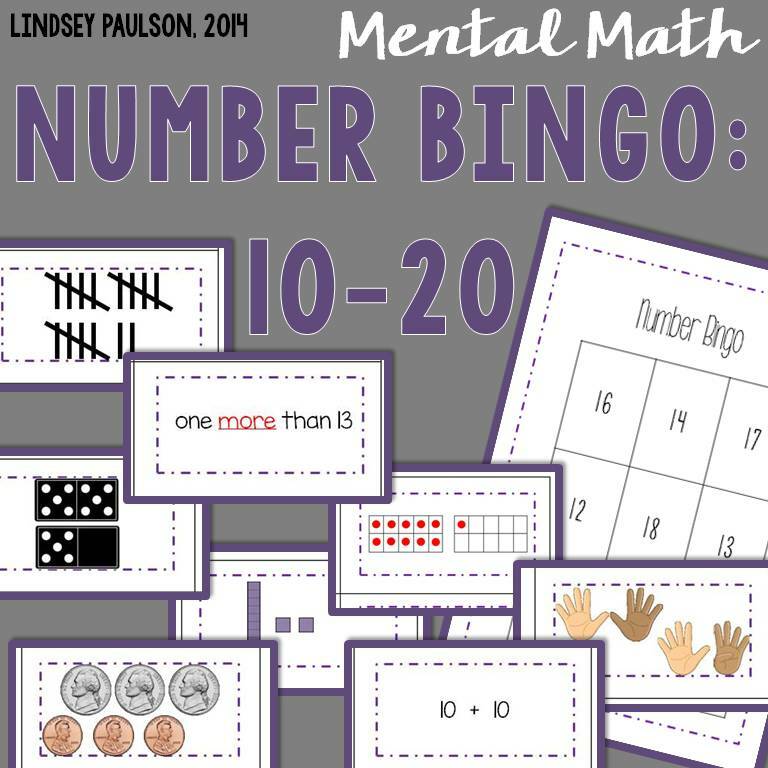 I personally don't think it's harmful to introduce the symbols AFTER they understand decomposing numbers, but the idea is students are not solving worksheets with numerous standard algorithms. K.7 - Money, students only need to ID attributes of coins and value. No counting sets! 1st only counts like coin sets and 2nd has mixed coins. This was a very hard skill so I'm glad to see counting was removed. K.8 - Changed "passage of time" to only include reading a calendar. Added ID days of the week, months of the year from 1st (Kindergarten has traditionally taught this, but now it's a standard to be assessed). Telling time to the hour moved to 1st. K.9 - Measurement only has direct comparisons of attributes (length, height, weight, temperature, volume, time). Non-standard measurement units moved to 1st. K.10 - ID and describe (no more tracing) of plane figures regardless their orientation in space (turned on its side). Now combined with K. 12 to describe relative location above, below, next to. K.11 - Read graphs, picture graphs, and tables. Tally marks moved to 1st. K.12 - Sort and classify object's attributes. No changes here. K. 13 - ID, describe, extend and now create and transfer repeating patterns. Includes pictures a patterns and transferring a pattern to make a similar repeating pattern. Overall I think the proposed changes move some what I consider "stand alone" standards to 1st and 2nd. Telling time to the hour and ordinal numbers do little for building number sense and are more isolated skills. With some of these skills moved, we have more time to focus on number sense, number sense, number sense. Hopefully we'll see an improvement in the later grades with students' quick computation because of the stronger foundation in K on number relationships. Any questions, comments, or concerns? Send off an email at mathematics@doe.virginia.gov. If you have concerns or praises, let them know! If you're looking for number sense activities for your Kindergarten classroom, check out these bingo games for base ten, ten frames, tally marks, money, simple addition and subtraction, and more! Thanks, Lindsey! I can't wait to share this.